At what age can otoplasty be peformed? Otoplasty can be performed as early as 4 years of age. Surgery should be performed prior to a child entering kindergarten or first grade and late enough where the ear has adequately developed. Why do the ears to protrude? Protruding ears are caused by the lack of development or an overdevelopment of the ear cartilage. What does this mean? Well, the most common cause for protruding ears is when the inside fold of the ear cartilage does not completely develop. This is called the anti-helical fold. The next, most common reason that the ears stick out is because the inside portion of the ear cartilage, the conchal bowl, is overdeveloped. This means that it is too large. These comprise the two most common reasons that the ears protrude. When visiting an otoplasty doctor that has a significant experience with this procedure, they will evaluate your ears and determine the best way to improve their appearance while maintaining a natural appearance. Otoplasty incisions are usually placed behind the ear and are not visible. They heal very well and should not be noticeable. 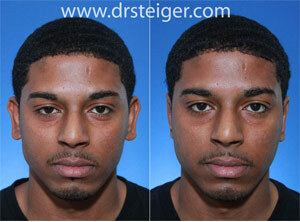 Otoplasty results are permanent and the procedure only has to be performed once. What is minimally invasive otoplasty? 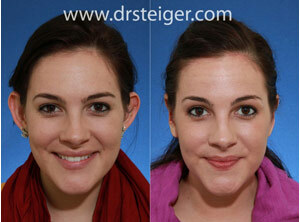 Minimally invasive otoplasty is an ear pinning procedure performed by Dr. Steiger using smaller incisions. This can be performed in the office procedure room under local anesthesia. Can otoplasty be performed on only one ear? Otoplasty can be performed on one side only, but this is done only in rare instances. If one side protrudes significantly more then the other, it gives the appearance that only that side is affected. Dr. Steiger performs meticulous measurements to verify the position of both ears. In the majority of cases both ears are affected and need to be repaired to achieve balance. Vigorous physical activity should be avoided for 1 week after surgery. It is important to avoid aggressive manipulation or trauma to the ear for 6 weeks after surgery. Activities which place the ear in jeopardy should be avoided. Patients are asked to where a head band at night for 6 weeks following surgery. Patients can experience a dull throbbing of the ears for a few days after surgery. This is relieved with a mild pain medication prescribed by our office. 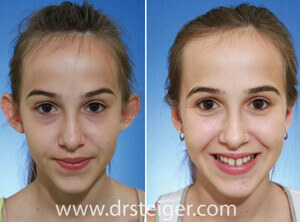 Can I fly in to have ear surgery by Dr. Steiger? Absolutely. Out of town patients can come in to have otoplasty performed in our Boca Raton location. Our office will help you coordinate your visit, the surgery, and your stay in beautiful South Florida. There are no restrictions on flying before or after surgery, once the Doctor sees you in the post-operative visits.